Aurizon Ear Drops 20ml provide effective treatment for bacterial and fungal infections in the ears of dogs. Aurizon Ear Drops - 20ml is a Prescription Only Veterinary Medicine and by law requires a prescription from your vet. Aurizon Ear Drops 20ml provide effective treatment for bacterial and fungal infections in the ears of dogs. Infection and inflammation of the outer ear canal is common among dogs, especially floppy-eared breeds, and is often referred to as Otitis Externa. Treatment with Aurizon Ear Drops reduces the pain and inflammation associated with the condition by impairing the bacterial DNA. When applied as directed by your vet, the active ingredient, Marbofloxacin, is a safe and effective treatment of both acute and chronic canine Otitis Externa. 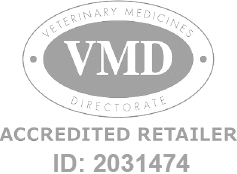 Aurizon Ear Drops are manufactured by Vétoquinol and developed specifically for dogs. As such, it must never be used in other animals.